It was late in another Phillies win, this one on a boiling Fourth of July at Citizens Bank Park, when a strange notion suddenly overcame me. Is this team a baseball version of the miracle Eagles? At the plate was Chris Davis, a Baltimore slugger floundering through the worst season of his career. A TV camera panned to an overhead shot from behind home plate, and the Phillies were playing without a third baseman or a shortstop. All four infielders were crammed onto the right side of second base. It seemed like an optical illusion. Now, I understand the Phils have embraced analytics, but playing without anyone on the left side of the infield was a bit much, even for them. Surely, the lefthanded Davis would slap the ball the other way, or lay down a bunt. How could someone with a .154 batting average refuse a sure base hit with his team down three runs late in the game? Ultimately, Davis did what he does best. Taking a mighty swing, he struck out. Clearly, there was never even a fleeting moment when he considered accepting the Phillies’ generous gift. Either through analytics or mind-reading or something, the Phils knew Davis would reject their offer. In an odd way, that moment reminded me of the Philly Special, though obviously the latter was in a far bigger moment on a far grander stage. Somehow, the Eagles knew, with absolute certainty, the Patriots would not be ready for a trick play late in the first half of Super Bowl LII. Now, I’m not saying the Phillies are about to win the World Series. In fact, I would bet heavily against that possibility. But there is no denying the similarities developing between the Eagles of last season and today’s Phillies. For starters, the field decisions are being made by veritable novices – second-year head coach Doug Pederson and rookie Gabe Kapler. Pederson loves to go for it on fourth down. Kapler uses his bullpen with similar head-scratching abandon. Pederson and Kapler both preach the gospel of statistical analysis. They are both player coaches – bosses who support, not belittle. No one expected the Eagles to accomplish anything special last season; most predictions had them at 8-8 or, with luck, 9-7. They finished 16-3. Until the past month, did anyone really believe this Phillies team would finish above .500? Even the front office was implying they were a year or two away from playoff contention. Currently, the team is in first place, with a 49-38 record. Defying logic has been a major theme for both teams. Of course, the best example for the Eagles was winning a Super Bowl without their brilliant young quarterback, Carson Wentz, who blew out a knee with three games left in the regular season. Until the very end, the defense was erratic, turnovers were a problem and the young kicker couldn’t convert extra points. None of that mattered. Meanwhile, the Phillies have an unreliable bullpen (except for Seranthony Dominguez), their big free-agent signings (Carlos Santana and Jake Arrieta) have underperformed, their exciting young shortstop (J.P. Crawford) is hitting .194 and playing mostly third base (when he’s not hurt), and the schedule has been filled with tough opponents for the past five weeks. None of that has mattered, either. The only major difference right now is the story of Nick Foles, a gritty former star who returned to Philadelphia and boldly went where no Eagle had gone before, becoming the team’s first MVP of the Super Bowl. The Phillies have nothing to match that dream scenario. What’s that, you say? 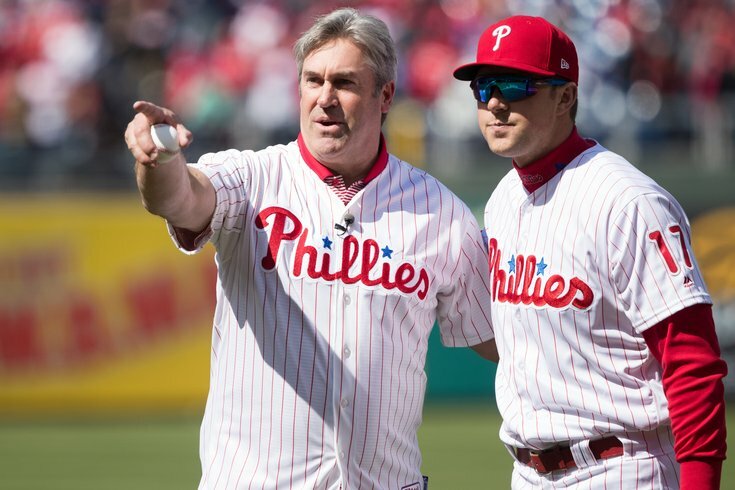 The Phillies are trying to trade for Cole Hamels, the gritty former star who boldly went where no Phillies pitcher had ever gone before, winning the MVP of the 2008 World Series? Hey, if that happens, all bets are off. •	In what world is a 4½ hour game ever a good idea? It happened on Friday night in Pittsburgh, when the Phils won, 17-4. That’s right, the Phillies won, and I’m still complaining. Analytics may be a major contributor to the success of the our ballclub this season, but they are killing the game of baseball. Here’s all the proof you need: Did you watch every pitch? Do you know anybody who did? The stat nerds are ruining the sport. It’s that simple. Swing the bat, dammit. •	Speaking of bad ideas, how absurd was it to see Markelle Fultz sitting in street clothes near the bench when the Sixers started the summer league season on Friday night? The No. 1 overall draft pick of 2017 played 14 games in his rookie season, and at last check his jump shot was still broken. There was not one young player on the court who needed game experience more than Fultz, and yet he wasn’t playing. Why? My guess is because he didn’t want to play. For future reference, here’s how to spell H-E-A-D-C-A-S-E.
•	Want to feel old? Preparations are under way to refurbish the Wells Fargo Center, which is – ready for this? – 22 years old. The 10th anniversary of the demolition of the beloved Spectrum is next year. Meanwhile, Lincoln Financial Field will turn 15 next month. It has been 14 years since Veterans Stadium was imploded. Even Citizens Bank Park, the gold standard for Philadelphia sports facilities right now, is 14 this season. Where did the time go? •	The highlight of the Eagles preseason this summer will happen nowhere near the field, especially because Carson Wentz will not play in any of the four meaningless games. No, the big day will be when Brian Dawkins is inducted into the Pro Football Hall of Fame on Aug. 4. in Canton. There was video last week of him receiving his tan Hall of Fame jacket, and even that was thrilling. Through his passion and tears, Dawkins will make one last connection that day with the fans who love him. •	Two Eagles names from the recent past made the police blotter in Jacksonville last week when a warrant for third-degree felony criminal mischief was filed against ex-wide receiver Jabar Gaffney after former cornerback Lito Sheppard accused his former teammate of slashing his tires and pouring something into his gas tank. Apparently, the two ex-Eagles have been feuding for years, but no one knows why. Here’s a big clue: They are cousins. There’s no better feud than a family feud.